Take a look at the calendar, the month of April is as good as over. This means that we have breezed through the first one-third of the year. In local tech and broadband, a lot has come with that passage of time, including a review of voice tariffs. We all hoped the Government and POTRAZ, the regulator, would jump in and prompt all Internet service providers and broadband merchants to also lower prices. This wasn’t the case. Luckily, the invisible hand of Economics appears to be working in our favour as consumers and since we last took a look at internet packages and prices, some adjustments have been made. There have been product and price reviews from Powertel and Africom as well as new internet services now available from TelOne in the form of WiFi and Fibre. Nothing has changed from the mobile telecoms operators in terms of price, but the proliferation of very cheap WiFi might just cause a product/price rethink. So how cheap, or expensive, is to go online in Zimbabwe right now? If you are in Harare (and Victoria Falls) it can be free from a ZOL spot or $1 for 100MB of WiFi from TelOne. These seem to be the best options available for quick access. For home internet, it still looks like its economical to get TelOne ADSL at $25 for 10GB. Here are most of the internet packages available right now and their prices. Thanks Nigel, been looking for a comparison like this for a while. Is there a heading missing (for Telco I assume) after NetOne? There are two different variants for TelOne, there’s the ADSL and there’s the Fibre to the Home. I just made the adjustment to make it clearer. Arnt telone packages 30 days? your telone packages are out of date!! Thanks for bringing that to everyone’s attention. http://www.telone.co.zw/residential/adsl We used the figures that were available from official TelOne platforms. If there have been any adjustments to these prices I’d really appreciate it if you shared them with everyone here. Telone not complaining at all! Thanks for a very detailed analysis but Telecel broad is old and should be adjusted to 4.5MB, 9.5MB, 76MB, 142MB etc respectively. Thanks for this, but I need to make one correction about ZOL WiMax packages. Starting in May, the $99 which I had been using is being increased to $115.50, so can you find out about other levels. The chart in your article has made me to now apply for a DSL Telone line. Goodbye ZOL and your eratic internet. Hahaha Fairgame apa wajuta… ZOL inofaya but Just spoke to someone from there and there is nothing on zvauri kutaura… I am on WiMAX for business. Econet advertises opera bundles. I bought the 3 day one and never got to use it. There was hardly any connection and felt cheated. In my part of town the data link is pathetic. 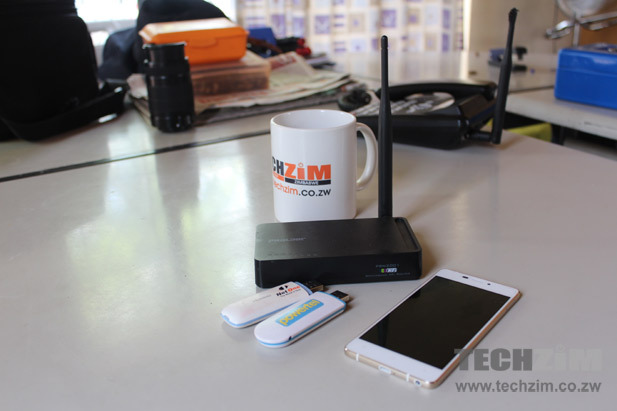 How do I win a TechZim coffee mug? TelOne Fibre to the Home is capped at 50MB for a 10Mbps connection? I am going to assume you meant 50GB? Africom is now useless busy throttling speeds and you cant even youtube anymor. They have blocked a lot of sites. It seems as if they don’t want us customers anymore and forget the reason we left powertel for them is what they are now doing to customers!! @ Tinashe, I think the problem with Africom packages is people fo not understand them their MiChoice package is meant for browsing ONLY not youtube. You can purchase regular bundle for that and you will be able to youtube all you want. As a student I enjoy the unlimited browsing and I find it very convenient. if they offered unlimted downloads everyone’s speed would be affected by a few bandwidth hogs who stream and download all day with no regard to fair usage which is what happened to powertel and caused them to discontinue their product. Think about it!